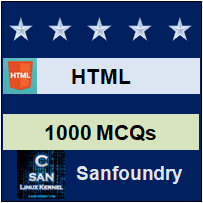 This set of HTML Multiple Choice Questions & Answers (MCQs) focuses on “HTML5 Video”. 1. Which protocol is supported by Android browsers? Explanation: HTTPS i.e. Hypertext Transfer Protocol Secure is used on internet. HLS which stands for Hypertext Transfer Protocol Live Streaming invented by Apple Inc., a new streaming protocol which is supported by android browsers. RTMP stands for Real-Time Messaging Protocol, FTP stands for File Transfer Protocol. 3. In HTML Audio/Video DOM, __________ sets or returns whether the audio/video should be loaded when the page loads. Explanation: Autoplay, preload, buffered, controller etc are the different kinds of attribute of video/audio element. Using autoplay, video/audio automatically begins to play. The preload property allows the author to provide a hint to the browser about what he/she thinks will lead to the best user experience. This attribute may be ignored in some instances. 4. Which of the following is not a HTML5 tag? Explanation: <video> tag is used to display video clips in HTML5. Multiple media resources for media elements is specified by <source> tag. Text track for media elements i.e. <audio> & <video> is provided by <track> tag in HTML5. There is no such thing as slider tag in HTML5. 5. What will happen if height and width of video are not set while video loads? Explanation: If height and width are not set, the browser does not know the size of the video. The effect will be that the page will change (or flicker) while the video loads. 6. Which of the following HTML Video – Media Type is not supported in IE? Explanation: The Ogg container format with the Theora video codec and the Vorbis audio codec is supported in desktop/mobile Gecko (Firefox), Chrome, and Opera, and support for the format can be added to Safari (but not on iOS) by installing an add-on. The format is not supported in Internet Explorer in any way. The most widely used format for HTMl video i.e MP4 format is supported in IE. 7. In HTML Audio/Video DOM, __________ sets or returns the default speed of the audio/video playback. Explanation: CurrentTime set or returns current playback position while playing audio/video. The length of the current audio/video is set or returned by duration. Default speed of playback is given by defaultPlaybackRate while playback returns speed of the audio/video. 8. In HTML Audio/Video DOM, __________ sets or returns the CORS settings of the audio/video. Explanation: CurrentTime set or returns current playback position while playing audio/video. The length of the current audio/video is set or returned by duration. Default speed of playback is given by defaultPlaybackRate. The purpose of the crossorigin attribute is to allow you to configure the CORS requests for the element’s fetched data. 9. In HTML Audio/Video DOM, __________ returns a TimeRanges object representing the buffered parts of the audio/video. Explanation: Preload is used to set or return whether the video/ audio has been loaded on page. Current network of audio/video has been set or returned by networkState. A buffered range is a time-range of buffered audio/video. The user gets several buffered ranges if he/she skips in the audio/video. Media controller of current video/audio is given or returned by controller.